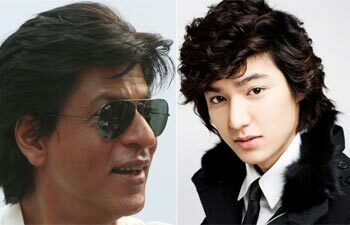 Shah Rukh Khan (left) and Lee Min Ho. "Shah Rukh Khan is good, but when it comes to romance, Lee Min Ho is much better. He is so cute," says 15-year-old Moytea, a Class X student in Aizawl, Mizoram. Lee Min Ho who? Even King Khan 9 may not be aware of the competition but this 24-year-old South Korean actor is a craze among teenagers in the North-East. He is not the only one. Actors such as Kim Hyun Joong, Lee Min Ho, Cha Tae-Hyun, Park Ji-yeon and Kang So-Ra are household names in the region. Beauty salons have posters of Korean celebrities and offer spiky, "Korean-style" cuts which are hugely popular with the youngsters. Even the language is peppered with Korean phrases like annyeonghaseyo (hello), kamsahamnida (thank you) and saranghaeyo (I love you). Plates and eating with hands have given way to rice bowls and chopsticks. What's more, as seen in Korean films and serials, many even sleep on the floor instead of on the bed. It's Korea all over the North-East. In September 2000, the Revolutionary People's Front, one of the secessionist groups in Manipur, banned Hindi films and Hindi satellite channels, to stop the "Indianisation" of the state. That's when the Korean influence began, and thrives as the ban continues. There was an entertainment vacuum in the state and people could not connect to South Indian, Bhojpuri and other regional channels. They started looking for an alternative channel that could give them wholesome entertainment. The search ended with Arirang tv, a 24-hour, English-language network based in Seoul that has beamed Korean films and serials since 1996. Korea's KBS World followed next with sub-titled soap operas. Even the local cable network, ISTV, began airing Korean tv dramas. India's Look East Policy also helped, as it opened trade between South-East Asian countries and India through Manipur, a border state with Myanmar. Pirated cds and dvds of Korean films and serials flooded the streets of Manipur and other North-East states. "I sell around 20 dvds a day. Each cost Rs.50. These dvds come from Moreh, a border town in Manipur," says T. Jiten, 22, a vendor in Imphal. Young girls and housewives make up the bulk of his customers, he says. "We have so many problems-water, electricity and insurgency. But everything looks so perfect in Korean films. They help me escape from the harsh realities of my life," says Abem, 42, a housewife in Imphal. Even frequent and long power outages can't deter people from watching Korean films. "My grandmother uses a generator to watch her favourite serials and films," says Kaboklei, 28, a school teacher in Imphal. The biggest influence of Korean films is on hairstyles. "On an average, I get 10 customers requesting me to style their hair like Korean actors," says Maisnam Ranjan, 38, owner of Orchid Beauty Parlour at the Gambhir Singh Market Arcade in Imphal. Manipuri film director, Romi Meitei, is, however, unfazed by the invasion of Korean films. "People do watch Korean films but Manipur films are also doing very well. They can't replace our industry," says Meitei. He believes the entry of direct-to-home (dth) service will end the Korean supremacy soon. "Insurgent groups can't stop dth service," says Meitei. Sociologists find the roots of this popularity in cultural proximity and ethnic similarity between the North-East and Korea. "The key factor is cultural proximity, both in appearance and values. The themes and characters that Korean movies and dramas depict strike a chord with both the younger and older generations in Manipur," says Otojit Kshetrimayum, a research scholar in sociology at Delhi's Jawaharlal Nehru University. "We can relate to the Korean cultural life as shown in serials and movies," says Sajouba, 25, a garment shop owner in Imphal. Kshetrimayum tries to explain this similarity in his research paper, Mapping Cultural Diffusion: The Case of Korean Wave in North East India. "The family name comes first in traditional Manipuri names, just like the Koreans. Among siblings, the younger ones do not address their elders by given names but rather eche (eonmi in Korean), meaning elder sister, or eyamba (oppa in Korean), meaning elder brother." The Korean wave reached Mizoram in 2006 when LPS, a local cable channel, started beaming Green Rose, a serial. "I knew of the Korean influx in Manipur. Hindi films were never popular in Mizoram and rural viewers were indifferent to Hollywood. So I thought of experimenting with a Korean serial. It became a huge hit," says Lalsawmliana Pachuau, owner of LPS Vision. LPS now beams 15 Korean serials. In 2010, LPS started two production houses where Korean films are subtitled or dubbed in the Mizo language. "We download these films from Net and then edit to add Mizo subtitles or dub them in Mizo," says Manuni, 23, a voice artist. The knowledge of Korean language is not mandatory, as most films come with English subtitles. Manuni and her team of 15 people earn an average salary of Rs.3,000. Like in Manipur, ethnic and cultural similarity worked in favour of Korean films. "Koreans are hardworking people like us. Also they are mostly Christians, unlike the Japanese," says Sauma, 28, a taxi driver in Aizawl. "The stories are also like the Mizo folk tales. It shows the conflict between rich and poor, good and evil which is a global theme," says Vanneihtluanga, editor and publisher of Aizawl-based magazine Lengzem. Like Pachuau, he also believes Korean films have united the Mizo society. "There are several dialects in Mizoram. But Korean films are dubbed only in Mizo language. So the people speaking other dialects have also learnt and started speaking Mizo. This has worked as a great unifier," says Pachuau. He, however, says that his channel makes no money by beaming Korean films. "The editing, translation and dubbing cost us Rs.30,000 per film. Local advertisements rarely cover that cost. But I can't stop them because of competition from other channels and their popularity," says Pachuau. He knows downloading films from Internet is illegal but he has no choice. "I wish Mizoram government took action to stop this trend. I personally don't like the influence of Korean culture in our youngsters," he says. Art and Culture Minister Zoram Sangliana feigned ignorance of any such trend and said he would look into the matter. Even Assam, which is quite glued to mainstream India and Bollywood, is not immune to the Korean wave. "I love Kim Hyun Joong and Lee Min Ho and keep watching episodes of Playful Kiss on YouTube," says Chayanika Saha, 19, a student of Tezpur University Assam. DTH, as Meitei says, may bring Bollywood back to the North-east, but it will have to co-exist with Korea. For now, the North-east is far from saying annyeong (goodbye).